Mathare North Rangers F.C is one of the best teams in the slums of Mathare North. 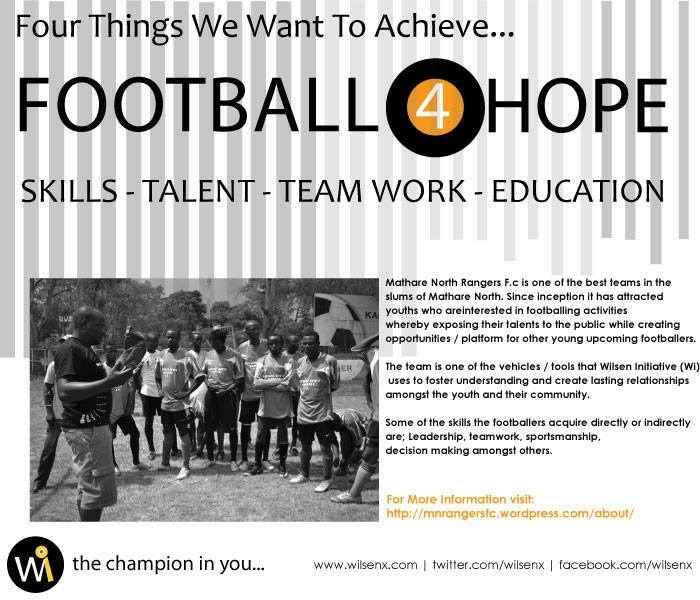 Since inception it has attracted youths who are interested in footballing activities whereby exposing their talents to the public while creating opportunities / platform for other young upcoming footballers. The team is one of the vehicles / tools that Wilsen Initiative (Wi) uses to foster understanding and create lasting relationships amongst the youth and their community. Some of the skills the footballers acquire directly or indirectly are; leadership, teamwork, sportsmanship, decision making amongst others. Amani Mtaani’ Football Tournament: “Amani Mtaani” means peace in the community, young people rarely has chances to connect with others in a meaningful activity especially during the festive season. In December 2012 we organized a football tournament dubbed “Amani Mtaani” whereby ten teams competed in a league basis play off and finals were played on the 26th December 2012. The main objective of this tournament was to preach peace and have the youth play together and forge new friendships despite their tribes and political affiliation. The most important rule of the tournament was to shake hands before and after each match and we strongly recommended praying together after the match despite the results. 2. Peace Campaign T-shirts: In 2011 we started a T-shirt campaign to sensitize the public on being patriotic and embrace diversity. It was the only creative way we could reach as many people as possible because we don’t have the machinery to run big campaigns like the politicians, but we believe young change makers can trigger positive channels of change using their creativity, talents and skills to address challenges in the community. Underlying theme: “What is your contribution towards a peaceful coexisting of people in Kenya while we still embrace our cultural diversity etc?” Under this banner we were able to design and sell more than five hundred T-shirts before the Kenya general election in March 2013. The idea was to spread the message in a simple and cost effective way. On 23rd April 2013, we had the pleasure to be invited by the Canada Mathare Education Trust (CMETrust) to give lectures to youth who are on school break after the first term. The mission of CMETrust is to advance education in Kenya by providing secondary school scholarships through funds raised annually, to students from Mathare Valley Slum, Nairobi; and, to raise awareness in Canada about education and poverty in urban Kenya. Key words: Arts & Culture, Leadership, Change makers, Social Entrepreneurs, Tech4Change, Sports for Change, Self Mastery, Global citizenship and Diversity. At Wilsen Initiative (WI) we believe in collaborating with like minded people in change making to reach a common goal. There are many social enterprises with a lot of similarity that seeks to address the same issues, and for a great idea to stand and survive you need support of all kinds. It’s evident that apart from having a great idea you need a passionate team and resources which include funds to drive your project. People with strong networks have always been able to reach their goals through a collaborative approach.